He could have become one of Australia’s richest men but Jeffrey Lee has turned his back on a fortune. 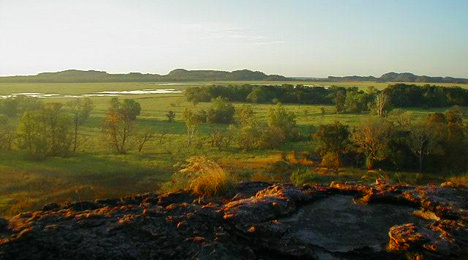 As senior custodian of the Koongarra uranium deposit he has decided not to allow mining on his land. ABC radio conducted this informative interview on rare earths – but rather light-pedalled their radioactive waste problem – C.M. The role of rare earths in your day to day life, ABC Radio 17 Sept 11, Philip Clark“……..the nature of some of these deposits is that they are quite complex. In essence they… as you mentioned, there’s lots of elements, particularly they’re present in small quantities. They’re in quite complex minerals, often in phosphate minerals; often they have uranium and thorium and other elements associated with them. That leads to complications in processing to some extent, but it also leads to regulatory issues, because around the world—in this country as well—there are jurisdictions that do not want or don’t allow at this stage, mining of uranium, even though that uranium might be a very, very small amount, as it generally is with these deposits. Philip Clark: My guest is Peter Arden. He’s a scientist and resources analyst at Ord Minnett. We’re talking about rare earths. These are unusual minerals, but with big uses in electronics—television sets, mobile phones, batteries, powerful magnets, all use these materials and most of the world’s supply at the moment is controlled by China. Is there an opportunity for Australia here? The processing of these minerals, though, is the key, isn’t it? That’s not straightforward, you need a processing plant, and extracting the actual rare earth from the mineral can be complex, can’t it?… in addition to the rare earths you generally find, as we’ve talked about, other elements—uranium and so on. The New York Times reported this week that China had largely shut down its rare earth industry for three months to address pollution problems. Officials confirm evidence visible by satellite that large tracks around both legal and illegal mine sites have become wastelands……. Although the illicit operation was finally closed down, pollution nightmares continue to haunt residents as toxic water from waste heaps and the makeshift mine finds its way into creeks and ultimately to the drinking water supply system. Nor is drinking water the only medium affected; REE are found in association with thorium, making waste from the refining process radioactive….. Apparently the government also plans to consolidate 80 percent of the production from southern China — which produces the rest of China’s rare earths — into three companies within the next year or two. All three of these companies are former ministries of the Chinese government that were spun out as corporations, and the central government still owns most of the shares. These actions will at least ensure Beijing achieves control of mining and refining; if pollution remains a problem, they only have themselves to blame. Too often, the western mining and milling sites have become Superfund sites costing the U.S. taxpayers hundreds of millions of dollars to clean and monitor in perpetuity. Witness Uravan, Colo., Monticello, Utah, and Durango, Colo…. Once leaching starts, the consequences can go on for generations. Tailings ponds overflowing is almost a certainty in Virginia as we have more rainfall than evaporation. Uranium ore waste is retained in the tailings and its radioactive half-life is 500,000 years or forever, whichever comes first. Clean Energy Council once again to be run by fossil fuel interests? Some years ago, the Clean Energy Council was heavily influenced by the fossil fuel industries – and so, not at all to be trusted on matters of renewable energy. [AGL – one of] the big three energy “gentailers” – along with Origin and TruEnergy – which already wield extraordinary power over the clean energy industry and effectively hold the power of veto over which projects and which technologies get funding….the concentration of power in the hands of the gentailers is not good, and it is their influence, rather than bad policy, that is often blamed for blocking the rollout of renewables. The submarine, which was completed four years late and massively over budget, has been hit by problems since it was commissioned into the Navy in August 2010. – C.M. Sailor jailed for nuclear submarine murder, Google News, (AFP) 20 Sept 11, LONDON — A sailor was jailed for 25 years on Monday for shooting dead an officer in a rampage on a nuclear-powered submarine that only came to an end when council officials overpowered him. Able Seaman Ryan Samuel Donovan, 23, pleaded guilty to killing Lieutenant Commander Ian Molyneux, 36, with an assault rifle when the HMS Astute was docked in Southampton on April 8. Donovan also admitted the attempted murders of Petty Officer Christopher Brown, 36, Chief Petty Officer David McCoy, 37, and Lieutenant Commander Christopher Hodge, 45…. Prosecutor Nigel Lickley told the court Donovan had told a colleague more than a year earlier that he was planning a “massacre” in the submarine’s control room…..
HMS Astute made headlines in October when it ran aground off the coast of Scotland and had to be towed home…. We’ve been seeing a lot of “wobbly words” lately – from the nuclear/uranium industry. You’ll recognise them – “the fundamentals” (always great, of course). And in today’s hype for Uranium SA’s Whyalla plan – “robust” economics. But the headline is the best in this one – “numbers stacking up”. – Well – the information that the share price of Uranium SA has fallen, and that it hasn’t secured financing – doesn’t bear out the enthusiastic headline. – C.M. The numbers stack up for Uranium SA, The Age, Barry Fitzgerald, September 20, 2011 SOUTH AUSTRALIA is in line to get another uranium mine, this time from a new uranium province being opened up by ASX-listed Uranium SA to the south of the industrial city of Whyalla, on the Eyre Peninsula. A study by USA into the likely financial returns from the development of one of the sediment-hosted uranium deposits it has outlined at its Samphire project – the Blackbush deposit – has confirmed ”robust” project economics…..
USA’s managing director, Russel Bluck, said USA’s financing options for the project development would include discussions with global integrated nuclear power groups. USA shares closed 0.5¢ lower at 15¢. new safety standards and changing public sentiment are likely to slow the advance of atomic energy….